Rent a photo booth that makes you Smile, with a camera that Snaps the moment, and creates the memories that make you Laugh. The Smile Snap Laugh Company started in the Winter of 2018. We service New York City, Long Island, Westchester and surrounding areas. With our newly added photo booth disguised as a mirror we provide everything you want from a traditional photo booth plus more. 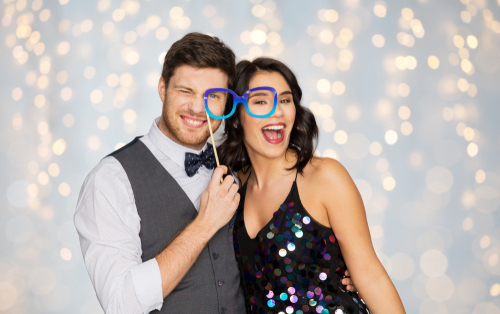 At Smile Snap Laugh, we strive to provide the ultimate photo booth experience for any occasion including weddings, sweet 16’s, holiday party’s, birthday party’s, promotional events and everything in between. We provide your guests a photo booth that will put smiles to there faces and create everlasting memories of the moments you cherish. The days of bulgy, over-sized booths are over. Thanks to our open air design, the mirror booth blends flawlessly into your event. With our various frames and template options the mirror will be a dazzling addition to your event. Smile Snap Laugh photo booth will print the best quality photos in the business! They will be available for you right there on the spot for you and your guests to enjoy and save as sovereign. The various print designs and availability for customization makes your prints unique. Our enthusiastic and fun filled attendants will oversee the entire proceeding so you don’t need to worry about a thing. Assisting your guests with all the different options available. Choose from our carefully chosen props designed for all types of events from Weddings to Halloween parties and everything in between. We can add custom props specifically for your event upon request. We offer a wide range of gorgeous backdrops and accessories to add to the Smile Snap Laugh experience. Choose from different colors and themes to fit your event. Don’t forget to include your snaps to your event #HashTag with our instant Text and Email option. Your guests can post and save there snaps electronically. Your event is around the corner, why procrastinate? Get in touch with our crew to check availability right now.